If you happen to be Canadian, Gord Downie is pretty close to being a household name. Like Gretzky. Or Trudeau. Bieber. Even Tim Horton. If you’re not from Canada, let me help paint a picture of this iconic musician, poet and free market capitalist through a “forest of whispering speakers,” if you will. America has Bruce Springsteen, Bob Dylan and Eddie Vedder. Ireland has Bono. William Blake was England’s answer to lasting prose and song. Canada has Gord Downie. There is no one like him. The lead singer and lyricist of The Tragically Hip—a band that commenced delivering their mercurial version of “the blues” in 1984—announced on May 24 he had been diagnosed with terminal brain cancer. Glioblastoma (GBM) quickly surged to the top of the search engine charts that day across Canada producing more hits than from the 8 million albums the band has sold over their career. I was in Denver of all places. Roughly ninety minutes before going on stage to deliver a keynote presentation, I received word like everyone else. Terminal brain cancer? It can’t be. 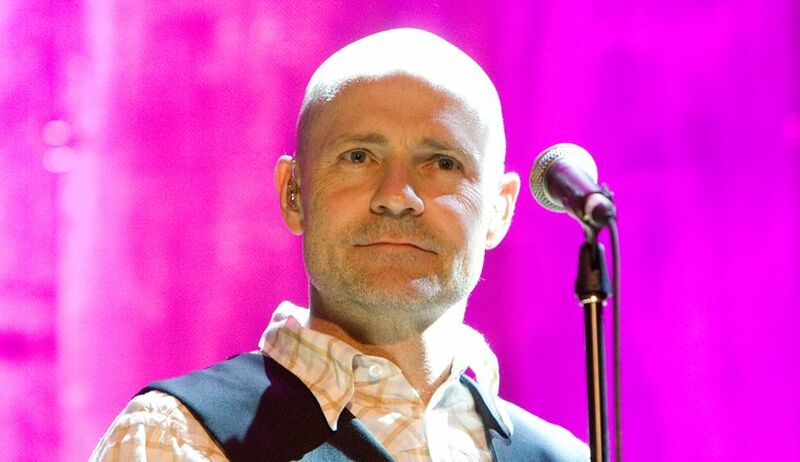 This is Gord Downie. He’s only 52-years old. He’s Gord Downie! Seated in a green room, I could not stop crying. Showing true Canadian grit if not unabashed determination, the band announced not only Downie’s cancer diagnosis, but the following day a summer tour. Not a detour. Not a faitour. A tour. A tour across Canada’s majestic and varied contour celebrating their latest album, Man Machine Poem. Back in Denver, I had to stop crying. If Downie and team were going on tour, I could at least get on stage and deliver my speech. If he had demonstrated a higher purpose, surely I could speak about purpose. He is a lot like Terry Fox, Canada’s “Marathon of Hope” hero. Resilient, yet humble. Determined, yet affable. A national treasure. Canadian, through and through. Downie has chronicled his observations in life like no other. His lyrics are draped in symbolism and verisimilitude. Omnipresent, however, is not only a love and curiosity for his country but the relationship he (and we) have with it, and most importantly, with one another. If you’re not from Canada—even if you’re not that into music—you probably have heard of Springsteen or Bono. Springsteen sings about the American returning from Vietnam in Born in the USA. Bono laments about a horrible chapter in Ireland’s history in Sunday Bloody Sunday. No matter your nationality, those songs are likely etched into your memory. If you’re not from Canada it’s very unlikely you’ve ever heard Downie’s synopsis on Canadian figures and events, his observations of relationships and life. In Daredevil, Downie highlights individuals (some say crazies) who purposely plunged over Niagara Falls in a wooden barrel. Born in the Water describes the inanity of a mayor in Sault Ste. Marie, Ontario who made a unilateral decision to turn a bilingual city into an English-only one. Something On delved briefly into the ice storm that hit Eastern Canada in 1998. Want to learn about a cholera outbreak in Canada? Listen to Lake Fever. Downie pays tribute to Canada’s peace keepers and soldiers in The Dark Canuck. His lyrics may overtly point out Canadian artefacts—such as Mistaken Point, Newfoundland or Moonbeam Ontari-ari-o in Fly—but often it takes twelve listens and several readings of the lyrics to sort out any kind of reference or meaning. “Terry’s gift is forever green, It got me up, back on the scene,” for example, pays a hoser homage to the aforementioned Terry Fox in The Inevitability of Death and Downie’s reverence for Terry’s own battle and resilience with cancer. And now, like Terry, there is an unexpected yet expedited inevitability of death for Downie. How tragically unhip. But the lyrics and poetry are but one side to Downie. He is, after all, a music lover. It is this love that has seen countless Canadian (and non-Canadian) bands added to various Hip tours. These bands have even found their way into the lyrics. Joel Plaskett, Odds, Sloan, City and Colour, Sam Roberts Band, By Divine Right, Hey Rosetta!, The Trews, Broken Social Scene … just a smattering of the musical acts he and the band have assisted over the years. My first live concert with The Hip was August 9, 1991 in Montreal. It was an awakening of sorts for me. It soon became an itch that had to be scratched as often as was possible. The Hip were touring their second full-length album called Road Apples. When the band took the stage, an inexplicable cosmic connection formed. It was live, and it was between us. Unless you have witnessed the band in concert, it becomes very difficult to describe. Pulsating duelling guitars courtesy of Rob Baker and Paul Langlois. A rhythm section headed by Gord Sinclair and Johnny Fay that puts any band to shame. It was the blues on an anabolic steroid. And then there was Downie, the former hockey goalie and curious frontman. Picture a hulking ectomorph who dances and pantomimes on stage as if auditioning for Juilliard. In parallel, he rants, recites poetry and adlibs tunes within, before and after almost every song on the set-list. Who does that? It wasn’t only unique, it was downright inspiring. I became transfixed by the unfolding scenario. I was hooked. He was part clown, part poet, part philosopher, part dancer, part Martian. I said to myself, “This guy’s got courage.” Sure enough, the band released a song the following year called Courage. Like a few other Canadian fans, I suppose I could be coined a “Hip Head.” I’ve been to countless shows since 1991 in Canada, the US and Europe. I stopped counting at the century mark. I’ve seen The Hip in a field, tavern, bar, gymnasium, cinema, backyard, living room, bowl, pier and even a zoo. I’ve attended Downie’s solo shows, poetry readings, and a wonderful compilation and concert series with The Sadies. They opened for the Rolling Stones. I thought The Hip stole the show. Mick Jagger had nothing on Downie. The rest of the band ran musical circles around Keith and the boys. Any time someone asks me what my favourite show is, I reply, “The last one.” Seeing The Hip live in concert is an unorthodox experience. It quenches an occasional need of mine. The need for a cerebral sonic circus. This summer, if someone asks me the question again, I’ll respond with, “The last one,” just like I always do. My first show this summer is July 22nd in Victoria. I’ll say it five more times throughout the tour culminating with the last concert on August 20th in Kingston. No one from The Hip camp has confirmed Kingston will be their last ever live performance, but if it is, I’ll be there mesmerized and in utter awe, much like I was some 25 years ago in Montreal. Indeed, a cerebral sonic circus. You can watch it live on CBC if you don’t believe me. “The last one,” I’ll say. Truthfully, like many others, I’m hoping August 20th doesn’t become my final answer. As Downie charts a new but imminent path to the waterfall with his 400 pound feather and trusty notebook intact, I’ll end with a short thank you. Thank you for teaching me to be at ease with being me. Thank you for inspiring me to become a better autodidact. Thank you for making me my oldest daughter’s “favourite teacher.” Thank you for pushing me to drown in the word—to find treasure or worse—all while honing my own handcrafted 400 pound feather. Thank you for a lifetime of memories … and love. Indeed love will be the longest thing that we do. You will be known, you will be loved? No, Gord, you are known and you are loved. Life may be too short for bad coffee, but death is too long for terrible poetry. Thank you for being our country’s poet. May we all be at ease with ourselves. Thank you for taking me into your journey as a Hip head. My appreciation for Gord, the band and for you has deepened reading your reflections. Very kind Laura. Many thanks. When I got to the part where you say you found out about Gordie just before going on stage to speak, my hand went to my mouth and I said, “oh no” out loud. what timing! But if I can say, I found comfort in knowing you cried for an hour after hearing the news. I was alone in my room that morning and sobbed for an hour. There’s a strange kind of comfort knowing I’m not alone in this… this deep an emotional reaction for a man I’ve never met but deeply respect and admire. Thank you Barb. Much appreciated.